Understand what goes into a designer's portfolio! Should you publish a website, use social media, or print a portfolio? In this free course you will be shown a variety of formats that each have their value and purpose. forever access to the FREEMIUMS inside the Studio. Whether you are a fashion, textile, or graphic designer the way that you communicate past projects and design work that you have created has a huge impact on your career path. If the presentation isn't clean, in the wrong place, format, or not viewed for long this might lead to opportunity loss. 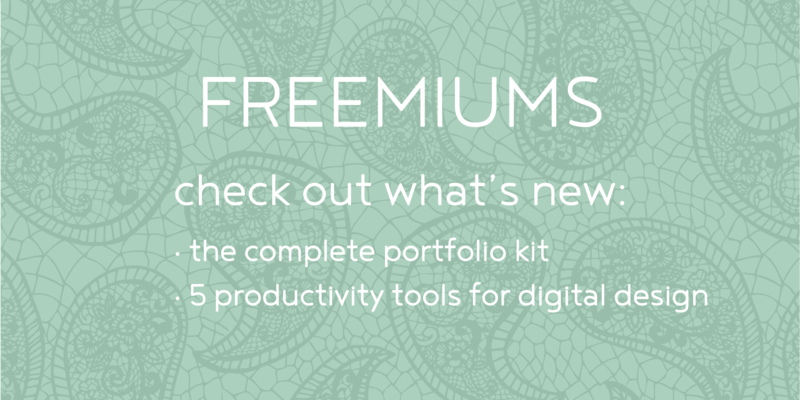 The information presented during this Freemium can be used right away to polish your portfolio. Should you showcase on you own site, on social media, or on well known portfolio site? I talk and walk you through my thoughts on this and share my experience and successes for each. You might already know and use Illustrator on a regular basis, so you can use it for printed or digital portfolio pages. Use this saving method from within Photoshop to make sure that your files are loading fast online and that the viewers do not leave before they view your work. Sometimes it is not that we do not know what we need to do, but just need a reminder and a checklist that doesn't keep our brain scrambled. Also a bit of a kick in the rear helps to get started and getting it done. Crush it with digital design! for FREE right away with an all access membership trial! "Adobe Illustrator and Adobe Photoshop are registered trademarks of Adobe, Inc. Neither the class offered, the instructors presenting the materials, nor FashionChalkboard.com are in any way affiliated with, sponsored by, or endorsed by Adobe, Inc.."
Table of content this way!